The Cold Therapy Roller reduces swelling, inflammation, and pain with a combination of cold compression and gentle massage. Cold compression therapy constricts the blood vessels in irritated skin which helps decrease swelling and eases pain. The drop in temperature of the skin slows cell metabolism, limiting cell damage to affected tissue. 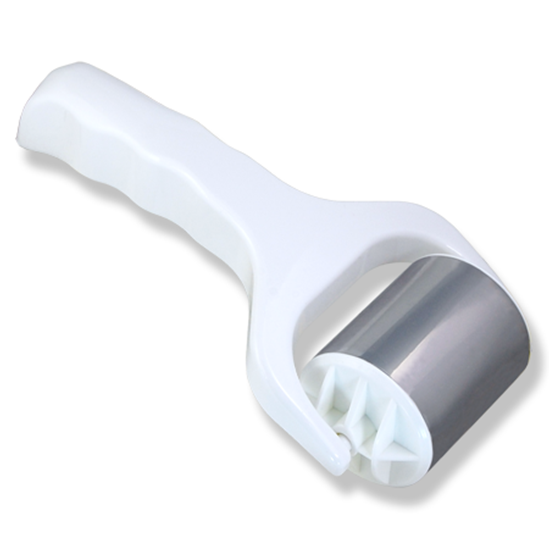 The easy to maneuver roller stimulates microcirculation in the tiny capillaries of the skin to improve delivery of oxygen and nutrients and promote skin detoxification. Cold Therapy Roller is ideal following beauty treatments, cosmetic surgery procedures, waxing, microdermabrasion, chemical peels, laser procedures for skin resurfacing, hair and tattoo removal. • No Water Mess: Not messy and clumsy like ice packs or ice cubes. • Targets the Irritated Skin: Easy to treat small areas of skin and to focus on sensitive hard-to-reach spots including upper lip, around nose and under eyes. • Gentle Massage: Rolling action provides a gentle massage. • Durable, Spa-Quality Material: Wheel is made from surgical grade micro-polished stainless steel.